This dress features a higher neck and shorter (but still-appropriate) hem — perfect for long days and nonstop nights. The stretchy ponte fabric stays structured and holds you in too. Made in NYC. A-Line silhouette with a subtle racerback shape and high neckline. Hemline falls above the knee (style runs a little bit shorter than other styles). Our model is 5’9” and wearing a size 2. 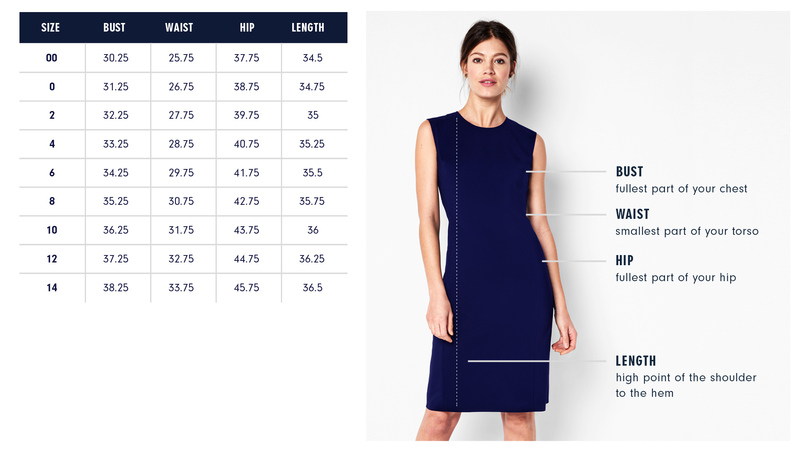 Below are the exact measurements of the Kenmare Dress. All measurements are in inches. For general brand fit, sizing, and measurements, please visit our Brand Fit & Size Guide. Machine wash cold; lay flat to dry. Do not tumble dry or use bleach. Dry cleanable. A-Line silhouette with a subtle racerback shape and high neckline. Hemline falls above the knee (style runs a little bit shorter than other styles). I love that the slight racer-back on this style adds a contemporary sportswear element. And unlike most racer-back styles you can snap your bra straps into the little bra strap loops so they never peek out! Features: Contoured armholes for coverage and movement.